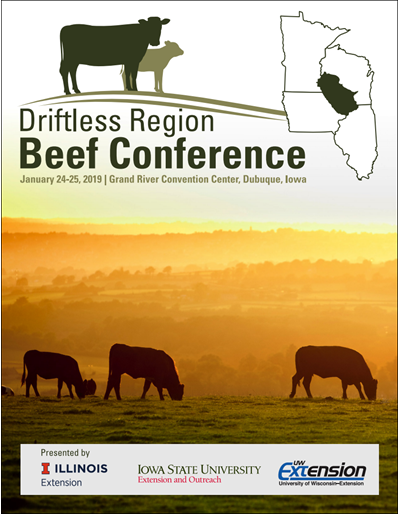 Cooperative Extension in Illinois, Iowa, Minnesota and Wisconsin partnered to offer the seventh annual Driftless Region Beef Conference on January 24-25, 2019 in Dubuque, Iowa. Each year this conference brings together beef producers for an educational program that focuses on the needs of this unique production region. 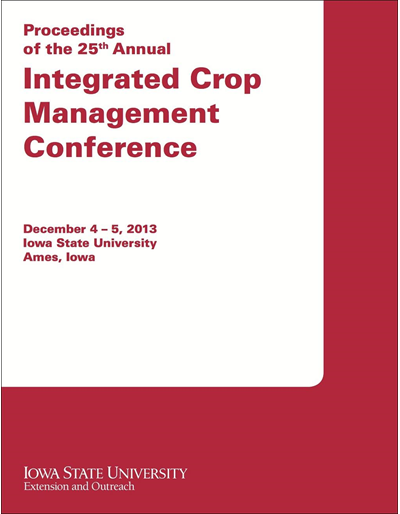 Topics include: Keys to profitability, controlling costs by reducing feed waste, common grazing mistakes, managing depreciation, feed cost comparison basics, Holstein and beef steer performance by self-feeding, value of reproductive efficiency, spreading overhead cost in the cow herd, effects of trace mineral supplementation of steers with or without hormone implants, effects of extended dry lot housing of beef cows, and more. These proceedings feature summaries from workshops presented as part of the 2019 statewide Crop Advantage Series. 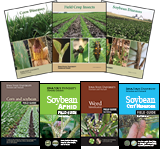 Authors provide key points of their presentation, references for print and Internet materials, and illustrations to explain crop production and protection. 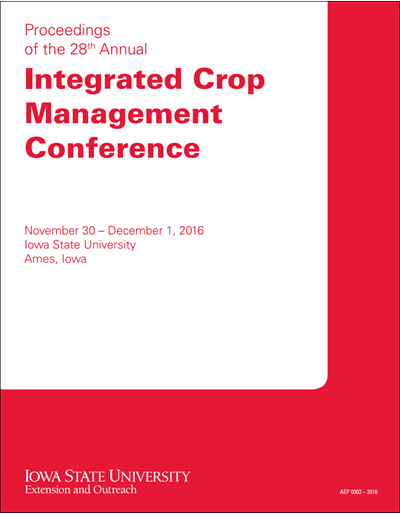 The publication also includes a list of Extension field agronomists and other resources offered to growers by Iowa State University Extension and Outreach. 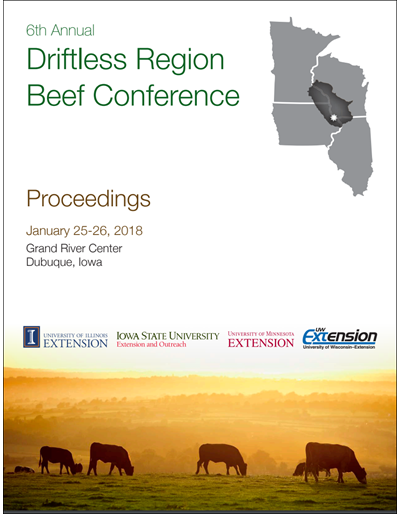 Cooperative Extension in Illinois, Iowa, Minnesota and Wisconsin partnered to offer the sixth annual Driftless Region Beef Conference on January 25-26, 2018 in Dubuque, Iowa. 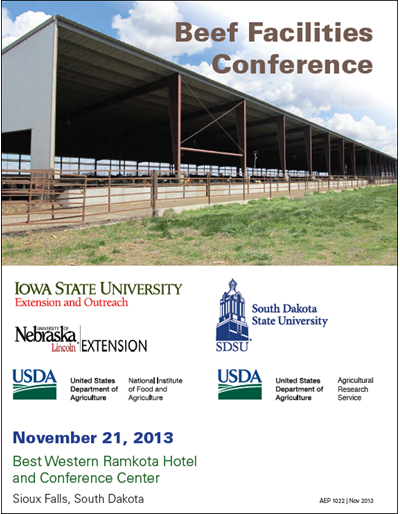 Each year this conference brings together beef producers for an educational program that focuses on the needs of this unique production region. 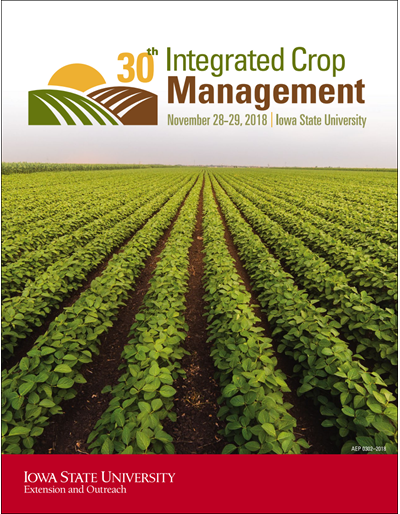 Topics include: Cover crops and nutrient management, capitalizing on soil health with cover crops and grazing, mycotoxins in cattle feed, cropping tools to prevent ear rots, risk management, grazing supplementation for pastured stocker cattle, management and vaccination strategies for healthy calves, insights on rumen health keys to a successful pasture system, and more. Cooperative Extension in Illinois, Iowa, Minnesota and Wisconsin partnered to offer the fifth annual Driftless Region Beef Conference on January 26-27, 2017 in Dubuque, Iowa. Each year this conference brings together beef producers for an educational program that focuses on the needs of this unique production region. Topics include: Bridging the gap between farmers and consumers, Maximizing margins for cow-calf producers through improved limit-fed hay procedures, Putting the grazing puzzle together, Feeding and managing cattle at heavy weights, Supplementing cows on spring forages, BQA feedyard self-assessment, Corn crop harvest endpoint and profitability in the feedlot, Myths and merits of grazing corn residue, Raising beef in the world of VFDs, Hedging: Using market tools to mitigate your price risk, and more. Edible flowers are a popular way to add color, texture, scent, and flavor to foods. Included is a list of some edible flowers, their culture, and suggested uses. Anyone interested in the beauty of the Iowa outdoors will find this booklet, prepared by the Iowa Association of Naturalists, useful for learning and teaching about the common plants in Iowa. This publication is part of Iowa’s Plants booklet series and offers a basic overview of Iowa’s summer and fall wildflowers, their ecology, and benefits. Detailed black and white drawings accompany the descriptions.